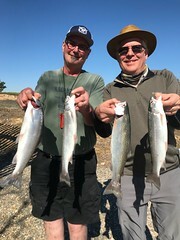 Returning clients Joel and his two boys were onboard with me on June 1st at New Melones in search of big rainbows. After setting four rods we began our days fishing adventure. 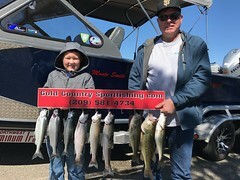 The day was tough as we could only get bass and crappie to bite our offerings, however we continued on and finally at the end of the day we had a good take down on the starboard side rod I handed the rod to 11-year-old Nolan and the fight was ON!! he did a great job fighting the fish as I was coaching him on what to do and he listened perfectly and soon the big five and a half pound rainbow was in the net, and it turned out we had a couple other missed opportunities as well. Thanks guys for coming out. 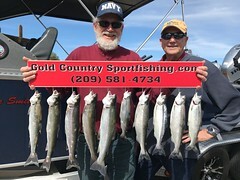 This entry was posted in Bass, California, Gold Country, Gold Country Sport Fishing, Melones, New Melones, New Melones fishing guides, Rainbows, Trout. Bookmark the permalink.